The goal of Wine Staging is to make applications work out of the box, but in order to provide compatibility from Windows 3.1 to Windows 10 it is sometimes necessary to dynamically change the behavior of Wine. 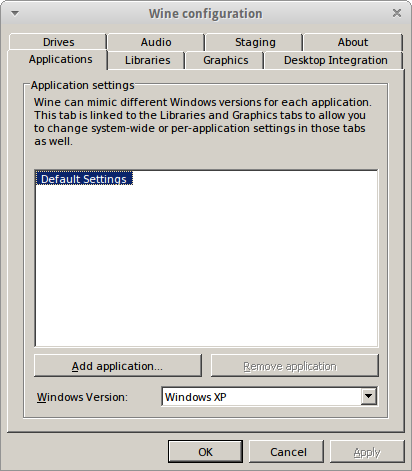 Some applications are for example incompatible with specific Windows versions and refuse to install. To solve this problem Wine contains many different settings and this page will give you are short overview about the most important ones. On the sub pages you will also find settings which are only available in Wine Staging. The different tabs contain short descriptions telling you what these settings are used for, but it makes sense to take a look at winecfg or the Wine User Guide for some more extended explanations. Since Wine Staging 1.7.33 there is also an additional *Staging* tab which contains switches for some experimental features. As the time of writing, you can enable/disable the Wine-Staging_CSMT in this tab. There are also some other keys which contain Wine settings, but HKEY_CURRENT_USER\Software\Wine is the most important one. Here you can change the sound driver between ALSA, Pulse and OSS or alter Direct3D settings. 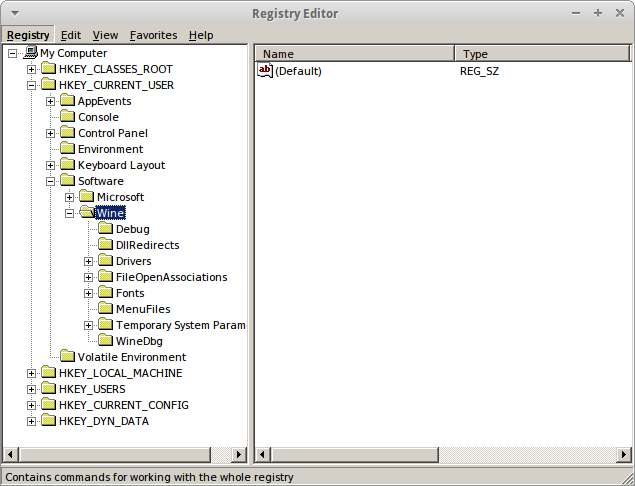 A full list of registry keys is available in UsefulRegistryKeys. Some of these keys, like DllRedirects are only available in Wine Staging and are described further in their configuration pages. This page was last modified on 4 October 2018, at 20:42.